Sounds awful. Thanks for keeping me from ever going there! Ah, memories… I grew up just the other side of the industrial park from where Tin Alley now stands. It was built as a Ground Round restaurant when I was a kid. It was the closest restaurant to our house; walking distance although I don’t think we ever did walk there. It was great fun for kids as they served peanuts and encouraged patrons to toss the shells on the floor. And a clown came to visit now and then. A very popular place. Also a memorable hangout from my high school years. But the Ground Round has left Framingham… and now this. How sad! BUT WAIT! I just discovered a VERY strange fact… the Tin Alley Grill *IS* a Ground Round. I can’t believe it! A personal friend of mine was a waiter at the Tin Alley Grill until about two years ago. Fortunately, I don’t think he had to deal with any putrid smells from the kitchen. I’ve eaten there maybe 3 or 4 times. It was at best “O.K.” I’d rather go to TGI Friday’s or Ruby Tuesdays – even Bickford’s ANY day rather than the Tin Alley Grill. Incidentally, The Ground Round restaurants were owned by Howard Johnson’s so I guess tbe Tin Alley Grill is their disgraceful grandchild. Last time I went, there was no wait staff (was about 12:30 on sunday), we had to seat ourselves. And you’re right, there was a smell to it, not sure where it came from, but there was something. Anyhow, I always get entrees there, so cannot comment too much. They have great nachos. I wouldn’t put it on my #$@# list yet but I am not sure I am gonna go back anytime soon after reading your experience. I was there Firday nite. Everythings seem to be okay. The waitress was very good. she give us our drinks and foods pretty fast. We had a great time listening to the music and people watching. I been going to this place for few years. This is still my favor place in Framingham. Great people and good price on their dirnk and food. I never smell anything there and bartender are great. The only two positive posts, made on the same day, from the same IP address on a two month old post. Mediocre food, sketchy happenings. Dummies in power cancelled what would have been my second show there. It’s enough to earn a place on MY sh*t list, thanks. We went there last winter, as they were serving all you can eat ribs. The ribs were lousy, and the extra servings were limited to two ribs each. The service was horrible, the manager was a jerk, and we will never enter this place again, even if the food is free. But I did save on a tip, as I didn’t even leave one. I’ve been to the Tin Alley a number of times, for both lunch and dinner. Agreed the food isn’t the best, but it’s not horrible either – about what you’d expect for the type of place and the price, I’d say. I’ve been with my wife and two little kids a couple of times and the wait staff was accomodating to us, which is always greatly appreciated. Never noticed any stench, either – although I have noticed a definite sewage-like stench outside (and sometimes inside) Owen O’Leary’s up the street just over the Southborough line. But that’s not Framingham…. My friends and I have been going to Tin Alley for a year. I never smell anythings and for the price the food is pretty good. The people that work that are great and very nice. I don’t like Friday’s its unfriendly and expensive, Owen is not my kind of place. I like this place and I tell all my friends about it and they like it also. Yet another good review of this place from “John C”/”D Evan” (who are the same IP). I work down the road from this place and infrequently visit. Last night I was working late and stumbled in for something, anything, to eat. I sat at the bar and ordered a sirloin steak. Although I was very hungry, it doesn’t take away from the fact that the food was outstanding. The steak was full of flavor, the mashed potatoes were top notch, the veggies were good and fresh. I wasn’t expecting much since it was 10pm at night but they sure exceeded my expectations in terms of food. 1) Bartender was very pleasant. 2) The manager could have given more smiles and face time from the other side of the bar. 3) Men’s bathroom was disgusting. Broken faucet knob, hand towel dispenser broken up, papers everywhere. Not clean. Only been there few time, I like the people, music and beer. Place look clean and didn’t smell anythings. 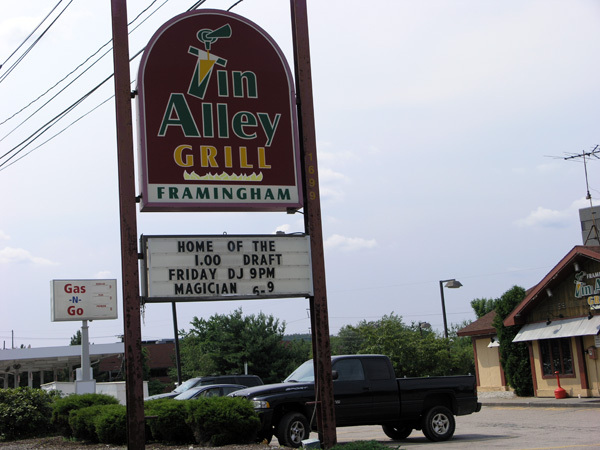 I had a great time the one night i went to the Tin Alley Grill. My question is does anyone know a blond girl called Erica that goes there sometimes? Was there on Friday, Sept 5, 2008 and we were told that due to a Framingham bylaw, as of Sept 1 they can no longer serve drinks larger then 16oz so no more 20 oz beers and that the new owner will not serve shots and that as of Sept 15th they will monitor your tab and will not serve you more then 2 drinks an hour. They want to make it a “Family” / neighborhood place. Are they nuts? They’re located in the middle of two industrial parks!! Where’s the neighborhood? I guess we’ll be headed to Owen’s now. The Tin Alley Grill is the Best.All Restaurant of MASS the cook are Brazilian.(90%). This is still my Favor Place in Framingham, great People and good Price. These comments are a joke. This place is a dump and the food stinks. Go to Owen O’Leary’s instead. My mom told me a story about how she and my dad went there for lunch once. They waited 20 minutes and finnally their waiter came out to tell them that all the cooks had to leave because some sort of agency came because there were illigal immagrants and they were going to be arrested. The cooks snuck out the back and the waitresses had to make my parents meals. I found that quite amusing.